Just two days ago we reported how Pali had become a very unusual out-of-season hurricane in the North Pacific. This afternoon another unusual hurricane has formed – this time in the North Atlantic. The hurricane season for both these regions usually runs from about June to November. Earlier in the week a non-tropical area of low pressure developed near Bermuda. This was a depression primarily driven by the clash of cold air from the north and warm air from the south, similar to the kind of depressions we experience in the UK. Strong winds were recorded on Bermuda as the depression tracked to the east. Then in the last two days the depression has started to develop a concentrated area of storm clouds near its centre to the extent that the National Hurricane Center declared it to be ‘Subtropical Storm Alex’. Being ‘subtropical’ is a hybrid state for storms which exhibit some, but not all the characteristics of a fully tropical storm. 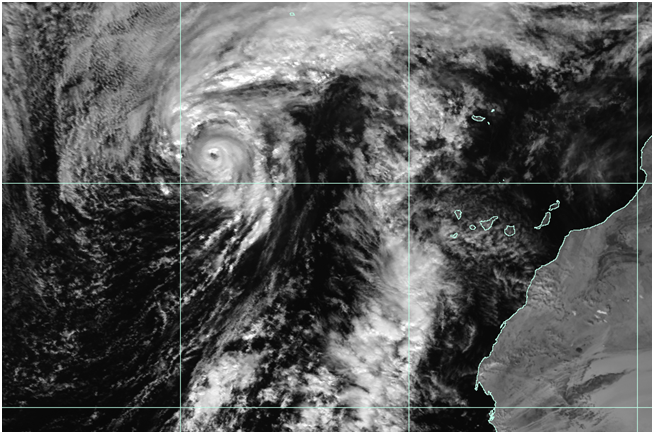 Alex became the first subtropical storm to develop in the North Atlantic in January since 1978. In the last day Alex has continued to develop a strong central mass of storm clouds rotating around a small eye and the National Hurricane Center has now designated it as a full blown hurricane. 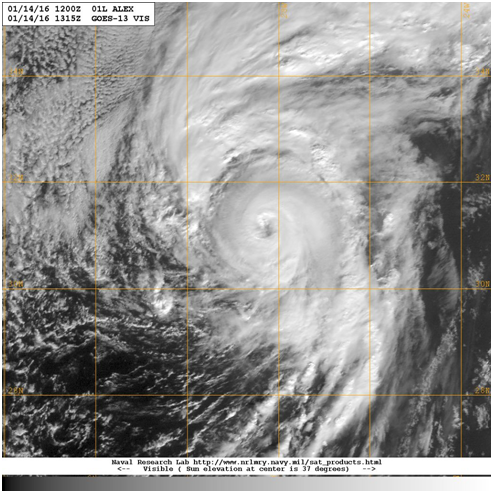 Alex is the first North Atlantic hurricane to exist in the month of January since Alice in 1955 and the first to actually form in the month of January since 1938. Alex is currently situated about 1000 km to the west of the Canary Islands. It is expected to move northwards bringing stormy conditions to the Azores where hurricane warnings have been issued. Winds over 75 mph and 100 mm rain or more is possible. An area of high pressure is expected to develop over the UK this weekend which should keep Alex over the ocean and away from our shores. Alex is eventually expected to be absorbed into a larger depression in the Atlantic near the southern tip of Greenland on Sunday. Official warnings for the tropical cyclones in the North Atlantic are produced by the US National Hurricane Center. The Met Office routinely supplies predictions of cyclone tracks from its global forecast model to regional meteorological centres worldwide, which are used along with guidance from other models in the production of forecasts and guidance. We also provide updates on current tropical storms via @metofficestorms on Twitter. This entry was posted in Met Office News and tagged @metofficestorms, heavy rain, Hurricane Alex, National Hurricane Center, out-of season hurricane, Storm, strong winds, subtropical storm. Bookmark the permalink.